(d) one or more green arrow indications." which is much less intuitive than simply using arrows, (transit) bars or bicycle symbols to differentiate different types of signal head. It feels like the Ontario law was written when burnt out light bulbs were a much more frequent occurrence; thus the backup/duplicate set. Then the farside pedestrian signal would have its countdown but the nearside would show STOP, to prevent pedestrians from starting their walk across the intersection. Of course, pedestrian signals like this wouldn't be used in Ontario because it's made in Britain. And to clarify, the primary reason that Ontario engineers would hesitate before transplanting such a design directly from the UK is not stubbornness, but in fact a significant difference in the way signals are placed. In Ontario, signals are on the far side of the intersection, with additional near-side auxiliary as necessary, whereas in the UK (and the rest of Europe) signals are near-side by default, with additional far-side signals as necessary. However, I don't know of anything in the Ontario regulatory environment that would prevent a near-side pedestrian signal in addition to the required far-side one. My main question is whether this is solving a problem that actually exists in practice. Do people enter the intersection during the Flashing Don't Walk because they don't know what the signals mean, or because they think they can make it to the other side in time? For me personally it is the latter. I commonly enter intersections during the FDW because I walk quite quickly and know I can clear the intersection in time. I would not appreciate new indications that tell me not to start crossing, even though I know I can do so safely. .. I think people don't pay attention to the Flashing Hand anymore. They look at the timer and determine if they can make it across in that time. 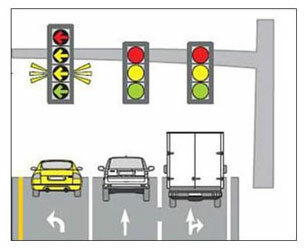 Do people enter the intersection during the Flashing Don't Walk because they don't know what the signals mean, or because they think they can make it to the other side in time? I enter because 80% the time I could get to the other side and back again before it turns solid. Some of those things start flashing 30 seconds before the light actually changes. They seem to be set for elderly with walkers or something. Countdown timers are much much more useful. I can cross a 4 lane street starting at the 11 second count and make it comfortably, at a walking pace, without abusing the all-way-red time period. That said, it's amazing how many people will blindly follow me into the intersection and get trapped in the middle when the light changes. If you're waiting because you can't make it, me going through doesn't suddenly mean you can make it. Metro explains: How do Toronto's crosswalks work? About 10 per cent of crosswalk buttons in Toronto don’t have any effect on traffic signals at all. Ever wonder what happens when you push the button at a crosswalk? Or why some lights seem to change instantly, while others will leave you waiting to cross for what seems like an eternity? Metro spoke with Linda Lee, a supervisor with the city’s Traffic Management Centre, to get the skinny on what exactly “push to cross” means. According to Lee, Toronto has about 2,300 controlled crosswalks. Of those, 70 per cent are what’s known as “semi-actuated.” Typically found at the intersection of a major thoroughfare and a residential street, these signals only change when a car pulls up or when a pedestrian pushes the crossing button. Depending on traffic volumes, Lee said you can expect to wait anywhere from six seconds to two minutes for the signal to change once the button’s been pressed. Once the walk light is on, the amount of time you have to cross depends on the size of the intersection. Generally speaking, Lee said pedestrians are assumed to be travelling at around one metre per second. Amusingly, about 10 per cent of crosswalk buttons in Toronto don’t have any effect on traffic signals at all. At these “fixed time” intersections, Lee said the buttons are only there so pedestrians with visual impairments can activate the audible crossing signal. One in three crosswalks in Toronto are equipped with accessible audio signals, Lee said. They don’t sound unless someone has held the button down for three seconds or more. The signals make a “cuckoo” noise for north-south crossings and a “chirping” sound for east-west ones, said Lee. Most crosswalks are equipped with a countdown, showing how much time is left before a signal change. However, just because a countdown is visible doesn’t mean the light is going to change, Lee said. At the end of the countdown, some crosswalks will simply reset if no one has hit the button. “So, if you see a button, the best thing to do is push it,” Lee said. huh... learn something new everyday! I didn't realize 1 in 3 crossings have audible signals, and that they could be activated by holding the button for 3 seconds. Amazing! Hopefully they are coming to the realization that they are not being used as intended and are (IMO) adding to intersection gridlock/confusion/congestion. Countdown signals are contributing to gridlock and congestion? Please explain. IMO, the reason why there's gridlock is because too many people are driving downtown, and proceeding through intersections when the road ahead of them isn't clear, backing up traffic on the cross-street. People are not looking at the countdown and saying (as they are supposed to) "oh, the countdown has started...I cannot enter the intersection but those people already in there have 'X' seconds to finish their crossing." Instead, almost universally, people see the countdown and say "oh, only 6 seconds to cross university, I better scurry along".......the old flashing hand did not tell pedestrians how long they had so more assumed that they should not go. When I am walking around downtown I get some funny looks (and have had people barge into me on more than one occasion) because I, strangely, stopped at the sidewalk at the sight of the countdown. If anyone thinks that gridlock has 1, and only 1, cause they are mistaken. I would not dispute that this particular driving behaviour (amongst others) is a contributing factor....but so is what I describe above....lights and their cycles are timed to try and give the correct share of time to, both, pedestrians and vehicles, when one or the other disturbs the balance it throws the efficiency of the controlled intersection out of whack. People are not looking at the countdown and saying (as they are supposed to) "oh, the countdown has started...I cannot enter the intersection but those people already in there have 'X' seconds to finish their crossing." Instead, almost universally, people see the countdown and say "oh, only 6 seconds to cross university, I better scurry along".......the old flashing hand did not tell pedestrians how long they had so more assumed that they should not go. They might well scurry across at 6 seconds when there is still plenty of time to cross. But I see lots of people not entering when it only says 2-3 seconds. And it's very reassuring when I've got kids with me, that we are in the intersection and it's starts with 20 seconds, rather than 6 seconds. I'm not seeing pedestrians in the intersection when it goes green in the other direction. Are you? Sorry, TOareafan, but if you can't deal with pedestrians walking downtown, with the right of way, and creating "gridlock" maybe you shouldn't be driving downtown. How many times do you see cars going through an intersection on a yellow light?